If you love to visit the ghostly shells of wrecked ships, the sea floor near Nassau and Paradise Island is littered with the remnants of man-made vehicles. These massive vessels are gradually becoming reclaimed by the natural world, serving as a habitat for a wide array of aquatic species. In addition to interesting shipwrecks, the waters off the Bahamas are also home to many plane wrecks. Some of these wreck locales have served as the backdrop for movies like the James bond and Jaws series. 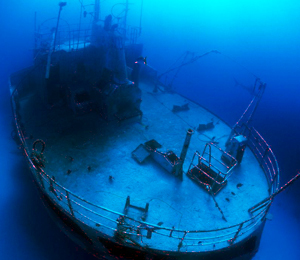 We have listed some of the finest Wreck Diving destinations near Paradise Island and Nassau. If you have any queries about other regional wrecks, please call our Bahamas diving experts. The LCT Barge once served the United States as a troop carrier during World War II. This easily accessible wreck rests upright in twenty feet of water. You'll witness swarms of fish near this wreck site which sits near the reef nicknamed the White Hole, a shallow circular crater which is home to a dizzying array of prismatic fish and variegated corals. This ninety foot wreck rests in two on its side in fifty-five feet of water. This wreck has become a thriving habitat for many exotic fish. You will probably spy large rays gliding along the sandy sea floor. You can investigate not one, but three of the best wrecks in the Caribbean Sea at the Shipyard. This nautical graveyard is home to three freighters resting at a depth of eighty-five feet. The abandoned vessels resting in close vicinity gives the area a supernatural feel. But just when you think you are approaching a series of lifeless vessel shells, a massive school of silversides will swarm through the scene, shifting away from the pursuit of predators like the Barracuda, the African Pompano, or the Schoolmaster. This large freight vessel (one hundred feet long) rests at a depth of seventy feet. This craft has become home to large schools of fish, including Snappers, School-masters and Grunts. A one hundred and forty foot Haitian Sloop is located near the bow of the De La Salle. You can still identify some of the rigging on this sailing vessel. You may recognize the large DC3 airplane from its appearance in the Hollywood Film, Into the Blue, starring screen siren Jessica Alba. This huge aircraft was intentionally sunk specifically for the film. Like the DC3, the Long Island Lady sits in approximately forty feet of water. This seventy foot long fishing vessel was recently sunk by Stuart Cove's dive operation. The newest wreck in the region, the Anthony Bell, like the Long Island Lady, was intentionally scuttled by Stuart Cove's dive operators. This ninety-foot-long tugboat sits upright in fifty feet of water. This vessel was meticulously stripped and cleaned before its sinking. You can penetrate both at the wheelhouse as well as at the stern of the Anthony Bell. Once entering through the stern, divers can maneuver into the engine room to the bow. Another new wreck, the much smaller Royal James, also rests nearby.